In the evenings, Mr Lui Hock Seng, 79, is a cleaner. In the day, he is a photographer on the prowl. Most mornings, with his Nikon camera stashed in his knapsack, he walks through different areas, such as the Redhill and Toa Payoh neighbourhoods, hoping to get some good shots. Mr Lui, who works as a cleaner at Singapore Press Holdings (SPH), became interested in photography as a teenager in the late 1950s, when he saw others taking photos. He too wanted to learn the skill. A friend introduced him to the South-east Asia Photographic Society, where he honed his art after becoming a member of the society for a few years. The son of a tailor and a housewife, Mr Lui spent decades working as a mechanic, which was his first job out of school. The third of six children, he could not afford a camera until his eldest brother bought him a German-made Rolleiflex about 55 years ago. The top-of-the-range mechanical camera, which used photographic film unlike digital cameras today, cost $300 - a large sum in those days. Back then, he did not have access to a darkroom to make prints, so he improvised by using black cloth to cover the windows in the bathroom or kitchen of the zinc-roofed house he shared with his parents and siblings. 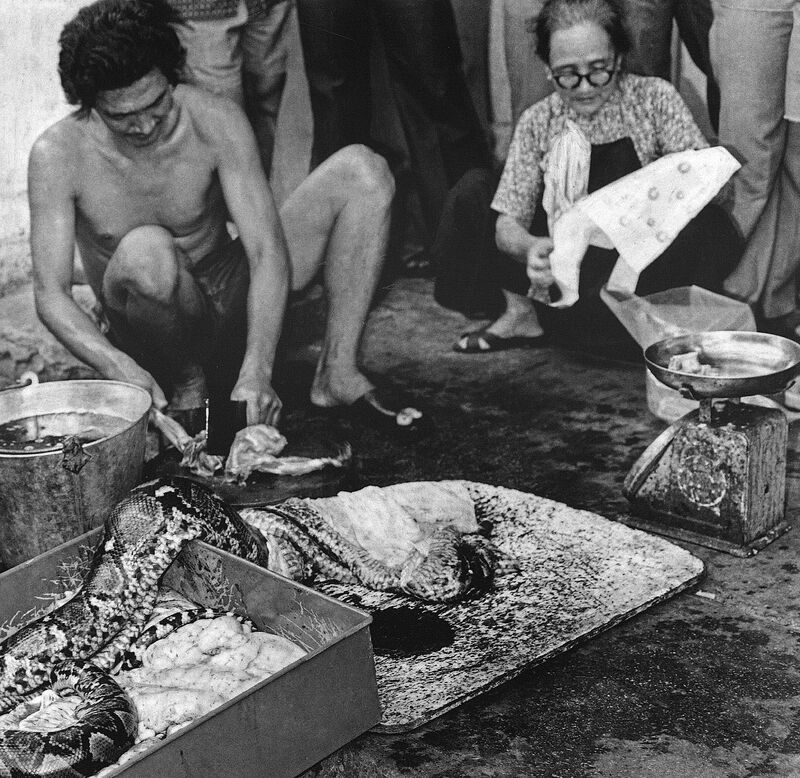 More than 50 years ago, he started taking photographs of a Singapore that has largely vanished - one shows a vendor selling snake meat in Chinatown; another, a young woman helping to build a roof. Even an accident at work in his early 40s, which resulted in partial loss of vision, did not deter him from his hobby. The damage, caused by a metal splinter striking his right eye while he was repairing a car, meant that he put his left eye to the camera instead. He has won several local and international photography competitions, winning a few hundred to a thousand dollars each time. The father of three started to work part-time as a photographer in 1965, taking pictures at weddings, dinners and funerals. He stopped at the age of 60 when he found the work too tiring. Despite his skill, he did not think that he could make a living as a full-time photographer as he felt that he would not have a stable income. Mr Lui, who has spent the last 14 years working as a cleaner, lives in a four-room HDB flat in Bishan with his son, who is in his 50s and whose mobility is impaired - the result of a cycling accident. His 80-year-old wife, who is wheelchair-bound, resides in an old age home. He has two other adult sons. Despite his age, he has kept up with the times, occasionally experimenting with Photoshop. Some staff at The Straits Times, which is owned by SPH, are contributing towards a new camera for Mr Lui, as his current, six-year-old digital camera is not working well. He has taken many photographs, from festivals to wildlife to portraits - but his favourite subjects were kampungs in areas such as Tanah Merah, Tai Seng and Potong Pasir. "There was a lot to see in kampungs - people washing clothes, as well as cows, goats and chickens. The best light is between 7am and 9am, especially when the sunlight shows through the clouds," Mr Lui says in Mandarin. Another favourite spot for him, in the 1960s and 1970s, was Merdeka Bridge, which spans the Kallang Basin. He used to leave his home in Geylang at 6am, an hour earlier than he had to, to go to Merdeka Bridge to take photos before cycling to work at Fraser and Neave, then largely a soft-drinks maker located at River Valley. He was a mechanic working on lorries and other vehicles. From the bridge, he took shots of barges carrying timber and fishermen casting their nets in the water. Last year, Mr Lui was among the thousands lining the streets for former Prime Minister Lee Kuan Yew's funeral. He was drenched while taking photos in the rain. These days, he gravitates towards crowds, seeking to capture images of individuals who stand out. "I'm looking for the weird and wonderful," he says.